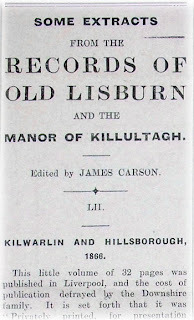 The original from which the following record is taken is in the possession of the Technical School, Lisburn. R.B.C. Registered for Borough and Co.
Q.B. Qualified for "Borough but not registered. Q.B.C. Qualified for Borough and County but not registered. W. Widow or sister of qual. voter. L. Living on the land. L.M. Do. and about a mile from town. H. Has been householder or voter. In the original, where more than one lot went to make up a holding the area of each separate lot in acres, roods, and perches is given. Here the aggregate area only is recorded in acres. The first figure following name represents the number of separate lots in the holding; the second figure signifies the aggregate number of acres. Where there is only one figure it represents the number of acres in the holding. Lisburn -- East of Hillsborough Road. Patk. Seldon -- X -- 1. Wm. Gregg -- X -- 4 -- RBC -- 15. Sam. Douglas -- X -- 2 -- RB -- 9. John Clarke -- X -- 2 -- 3. James Smith -- X -- 3 -- 8. George Whitla -- X -- 5 -- RBC -- 11. Dr. Thompson -- X -- RBC -- 5. Thos. Shaw -- X -- 3 -- H -- 9. George Wilson -- X -- 2 -- QB -- 4. Edward Hogg -- X -- 5 -- 6. Mr. Coulson -- X -- 5 -- RC -- 7. Hu Mulholland -- X -- RBC -- 4. John Magennis -- X -- QB -- 2. Geo. Morrow -- X -- QB -- 2. Wid. Can -- X -- W -- 2. George Pelan -- X -- RB -- 3. Rainey Boomer -- X -- QB -- 4. Hy. Mulholland -- X -- 3 -- RC -- 5. Dr. Musgrave -- X -- RB -- 3. Danl. M'Veigh -- X -- QB -- 3. Richard Murray -- X -- RB -- 3. John Pennington -- X -- RB -- 3. David Beatty -- X -- 3 -- RC -- 5. Wid. Bell -- X -- 3 -- W -- 5. Jos. Blackburn -- X -- ML -- 3. John White -- X -- QB -- 2. Jas. Major -- X -- QB -- 3. John Dixon -- X -- 2 -- RB -- 3. John Moore -- X -- 2 -- QB -- 3. John Major -- X -- 2 -- RB--4. John Hill -- X -- 2 -- RB -- 5. Jas. Hogg -- X -- 6 -- RBC -- 12. Robt. M'Clure -- X -- 2 -- QB -- 7. Matthew Mussen -- X -- 2 -- RBC -- 5. Erskine Neely -- X -- 4 -- CB -- 6. Dr. Whiteford -- X -- RBC -- 5. Jas. N. Richardson -- X -- RBC -- 7. Wm. Graham -- X -- RC -- 2. Rev. Jas. Stannus -- X -- 2 -- 12. Richard Greer -- X -- 3 -- RBC -- 4. John Pennington -- X -- RB -- 1. Jas. Smyth -- X -- 4. Wm. Black -- X -- 2 -- QB -- 4. Dr. C. Cupples -- X -- QB -- 3. Henry Magee -- X -- RB -- 3. John Magee -- X -- QB -- 2. Hugh Boyd -- X -- RB -- 3. John Fleming -- X -- QB -- 3. Dr. Cupples -- 7 -- RBC -- 15. John Major -- X -- RB -- 3. Wm. Johnston -- X -- QB -- 3. Quaker School -- X -- 11 -- 20. Let for £23 16s per annum; leased in perpetuity. Rev. E. Cordner -- 4 -- QB -- 8. Dr. Stewart -- QB -- RC -- 4. Major Stewart -- 2 -- 6. Mrs. Mead -- W -- 2. Chas. Casement -- 2 -- RBC -- 4. James Knox -- QB -- RC -- 2. Infirmary -- 3 -- 3. Rev. P. Fletcher -- RB -- 1. Rev. E. Thompson -- QB -- 4. Dr. Turner -- RB -- 2. Wid. Mulholland -- W -- 2. Dr. Stewart -- 3 -- RC -- 4. Wm. Phillips -- 3 -- QBC -- 5. Geo. Boomer -- 3 -- RC -- 6. Lisnegarvey -- East of New Mail Coach Road. Rev. Jas. Stannus -- 2 -- 11. Jas. M'Keown -- L -- 1. Chas. Casement -- 2 -- RBC -- 5. Archd. Trail -- 2 -- RBC -- 9. Mr. Richardson -- RC -- 5. Archdeacon Trail -- 7 -- RBC -- 21. Samuel Kennedy -- 4 -- RC -- 11. Wm. Colbeck -- 3 -- RB -- 6. Cap. T. Fulton -- RC -- 4. Capt. Smith -- 4 -- 7. Hy. Mulholland -- 2 -- RC -- 4. John Richardson -- 3 -- RC -- 6. Wm. Pelan -- 4 -- ML -- 3. Moses Hill -- 4 -- LM -- 4. Rt. Williamson -- QC -- 8. Infirmary -- 3 -- 5. Dr. Stewart -- RC -- 3. Mrs. Hogg -- W -- 3. Robert Seeds -- QC -- 4. Jas. Richardson -- RBC -- 4. Jonathan Richardson -- QC -- 4. Rev. P. Fletcher -- 5 -- RB -- 14. Rev. Ed. Thompson -- 2. Capt. Fulton -- RC -- 3. Lambeg Glebe -- 7 -- 16. Matthew Pelan -- 3 -- LM -- 3. Mr. Legg -- 2 -- QC -- 5. Wm. Colbeck -- QC -- 1. Samuel Kennedy -- 7 -- RC -- 6. Mrs. Higginson -- W -- 2. Susana Wheeler -- 6 -- W -- 7. Lisnatrunk -- Lambeg Parish, County of Down. Wid. Nowell -- 4 -- W -- 3. John Bidulph -- 3 -- 6. Geo. Campbell -- 9 -- L -- 13. Warren Clarke -- 4 -- L -- 3. John Campbell -- 7 -- L -- 7. Robert Campbell -- 5 -- L -- 7. Wid. Rainey -- 7 -- LM -- 7. Mrs. Murdock -- 5 -- LM -- 10. Geo. Cahoon -- 9 -- LM -- 10. Jas. Mussen -- RC -- 2. Robt. Allister -- 2 -- QB -- 3. Wm. Major -- 2 -- QB -- 4. Largymore -- Parish of Lisburn, County of Antrim. Geo. Moore -- 3 -- QBC -- 14. Mrs. Bell -- 3 -- W -- 7. Mrs. Hancock -- W -- 3. Hugh Seeds -- RC -- 3. Wm. Hodgen -- QB -- 3. Wm. Murray -- QB -- 3. Dr. Thompson -- 3 -- RBC -- 5. Wid. Singer -- W -- 4. Francis M'Gaghey -- 8 -- QB -- 11. Wm. Coulson -- 4 -- RBC -- 20. Geo. Pelan -- 3 -- QB -- 4. John Woods -- RC -- 3. James Thompson -- 2 -- RC -- 7. John Clarke -- 6 -- QB -- 8. Edward Herron -- 2 -- RB -- 4. A. Lawson -- 2 -- QB -- 4. Benj. Neely -- QB -- 4. Robert M'Clure -- QB -- 4. Edward Dickey -- QB -- 3. Daniel M'Veigh -- QB -- 3. Dr. Dixon -- RB -- 2. Alex. Brownlee -- QC -- 2. Francis Turner -- 4 -- QB -- 5. Wid. Pelan -- 3 -- W -- 5. Wm. Walsh -- 2 -- LM -- 4. James Farrell -- 2 -- 3. Henry Bell -- 2 -- RBC -- 2. John Mackey -- 2 -- QB -- 3. Rev. A. Craig -- 4 -- 3. Jas. Dornon -- 5 -- QB -- 7. Geo. Emmerson -- 2 -- 5. Benj. Neely -- 2 -- QB -- 4. Wm. Dillon -- 7 -- RC -- 11. Jas. Turner -- 4 -- H -- 6. Jane Edgar -- 2 -- W -- 3. Wid. Bannister -- 3 -- W -- 4. Edward Bannister -- 15 -- LM -- 37. R. Boomer -- 5 -- QB -- 12. W. Boomer -- QB -- 3. Andrew Craig -- 5 -- L -- ll. Geo. Simpson -- 2 -- QB -- 3. David Reid -- QB -- 3. Saml. Smith -- 4 -- QB -- 11. Mrs. Boyes -- 5 -- W -- 8. John Woods -- 4 -- RBC -- 6. Wm. Sands -- 2 -- 1. Edward Farrell -- 7 -- 14. Chas. Weldon -- 2 -- QB -- 3. Edward Ilivion -- RB -- 2. Patk. Rogers -- 3 -- RC -- 5. Edward Thompson -- 3 -- QB -- 2. Hu Anderson -- 2 -- QB -- 3. Hu Mulholland -- 2 -- RBC -- 4. Largimore -- West of Old Hillsborough Road. Teal M'Keown -- 3 -- QB -- 4. David Finlay -- 2 -- QB -- 4. John Dowdd -- 4 -- H -- 5. Capt. Boyse -- 2 -- L -- 3. Miss Kelly -- 3 -- QB -- 4. Saywell Clarke -- 4 -- QB -- 5. Jas. Pattison -- 3 -- QB -- 4. Wid. Pelan -- W -- 3. Thos. Pelan -- 2 -- QB -- 2. Saml. Smith -- 2 -- QB -- 3. Edward Herron -- 2 -- RB -- 5. James Ward -- 2 -- RBC -- 4. Messrs. Boyd, Vitriol Works -- 5 -- 18. Richard Sorby (a grove) -- 4. John M'Dowell -- 3 -- QB -- 3. James Tuton -- 2 -- H -- 2. Major Parker -- QB -- 4. Archd. M'Ateer -- 2 -- QB -- 3. Wm. Wilson -- 2 -- L -- 2. Hy. Mulholland -- 2 -- QB -- 5. Dr. Dixon -- 3 -- RB -- 6. Alex. Brownlee -- 4 -- QBC -- 4. Patk. Reed (quarry) -- 6 -- L -- 5. Wid. Sloan -- 2 -- L -- 2. Robt. M'Call -- RBC -- 4. John Sinclair -- 6 -- L -- 8. Wm. Walsh -- 6 -- LM -- 6. Jas. Murray -- 3 -- QB -- 4. Adam Wilson -- 2 -- QB -- 2. Wm. Wilson -- cottage -- L.
Miss Crawford -- W -- 3. Thos. Wright -- 2 -- 3. Richard Foots -- 4 -- RB -- 5. James Ward -- 3 -- RBC -- 6. 'TWAS PRETTY TO BE IN BALLINDERRY. The Editor is indebted to Francis Joseph Bigger, Esq., Belfast, for drawing his attention to the fact that this ballad by Mr. Graves -- referred to in article LII. -- is only a new version or adaptation of a much older poem. Mr. Bigger writes:-- "This song is far older than Mr. Graves' day. The air, 'Ballinderry,' is far older still. Petrie considered it one of the oldest Irish airs extant." Edward Bunting in his "Ancient Music of Ireland," 1840, states:-- "The air 'Ballinderry' is very ancient, author and date unknown, procured from Doctor Crawford, Lisburn, 1808." Bunting gives the score of the music and the first verse of the ballad as current in his time, with notes on its antiquity and variations. Sitting under an ivy tree. Oh! that I was with Phelimy Diamond. Till we would make the whole Island ring. The ballad has been a favourite performance from time immemorial with the peasantry of the Counties of Down and Antrim, the words being sung by one person, while the rest of the party chant the "Cronan," or chorus. 'Tis pretty to be at Magheralin. 'Tis pretty to be at the Cash of Toome. Mr. Graves in his "Irish Songs and Ballads," 1880, states that his poem, "'Twas pretty to be in Ballinderry," was suggested by reading the stanza given in Bunting's collection. Extracts from two old manuscript books in the possession of Mr. George H. Sands, C.E., Lisburn and Dunmurry. ORDERLY BOOK, GARRISON OF LISBURN, 1803. In General Orders, 6th August, 1803, it states that the Garrison of Lisburn shall consist of the Lisburn Cavalry, Lisburn Infantry, Ballinderry Infantry, and Broomhedge Infantry. All strangers who cannot account for themselves to be apprehended and sent under a secure guard to Belfast; if taken in a house, the master to be also sent prisoner. All places suspected of having concealed arms or ammunition to be searched. Frequent patrols of Cavalry and Infantry to be sent out, and such guards mounted as may be considered necessary. All parties searching for arms must be accompanied by an officer, who will be accountable. Then follows instructions as to guards, parades, &c. The word or sign for each day is given, the name of company on duty, and name of orderly officer for the day, general notes and instructions by the Officer Commanding, and copies of some letters. There is a cash account for the year 1822, in which the men appear to have been served with trousers, for which they had to pay 8s per man. The Oath of Allegiance is given under date 1831. LISBURN CAVALRY ACCOUNT BOOK, l798. This book contains a general troop account and a separate account for each trooper. In article xxiv. will be found the names of the men in the troop as taken from this book. The only one remaining here, a witness of the past. Next Week: Report on Municipal Corporations, 1833. 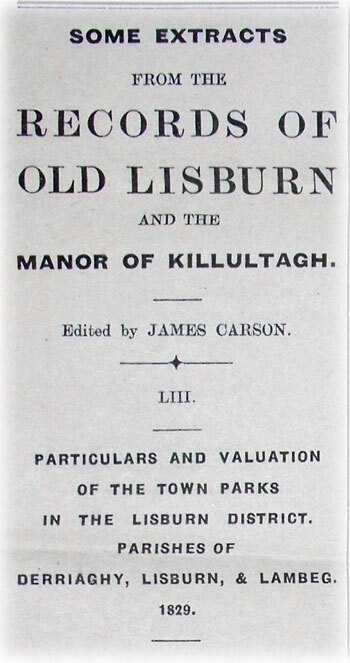 Particulars and Valuation of the Town Parks in the Lisburn District. 1829. The original from which the following record is taken is in the possession of the Technical School, Lisburn. Cottages and gardens are not included in this valuation. The original document specifies the annual value of each holding and the value per acre. In Clogher the value per acre ranges from 26s to 42s; average 32s. Maghrelave, 32s to 37s; average 35s. Tamna, 28s to 80s; average 50s. Knockmore, 20s to 55s; average 34s. Old Warren, west of Longstone Lane, 28s to 60s; average 37s. Old Warren, east of Longstone Lane, 20s to 60s; average 40s. Lisburn, east of Hillsborough Rood, 25s to 80s; average 48s. Lisnagarvey, 30s to 70s; average 46s. Lisnagarvey, east of New Mail Coach Road, 30s to 60s; average 50s. Glenmore, 30s to 52s; average 40s. Lisnatrunk, 23s to 55s; average 33s. Largimore, 30s to 70s; average 46s. Largimore, west of Old Hillsborough Road, 20s to 70s; average 47s. Ballynamullen, 40s to 60s; average 48s. Q.B. Qualified for Borough but not registered. It will be found that the reference X is somewhat difficult to understand even if it is always correctly used, which is doubtful. Although all Lisnagarvey is within the borough, only about half the names are marked X, and none of the names are so marked in Glenmore, Lisnatrunk, Largymore, or Ballynamullan. Clogher, which is not within the borough, has almost all the names marked X. The reference in the original reads -- "X -- Within the borough." If it read "Residing within the borough" it might be more intelligible. Thus, Charles Shields, Clogher -- X -- 4 -- RB -- 10, would mean that his holding of 10 acres consisted of four separate lots, that he was registered as a voter for the borough, and that although holding land in Clogher he resided within the borough, his name also appearing in Tonagh -- within the boundary -- as Charles Shields -- X -- 2 -- RB -- 5. It is well known that down to within recent date in country towns, and indeed in many places the custom is still prevalent, that practically every business and professional man was also on a small scale a farmer. They resided within the precincts of the town or borough, and while carrying on their usual avocation, held and worked a portion of land either for pleasure, convenience, or profit in the immediate vicinity. Other examples of individuals holding land both inside the borough and outside of it, and having holdings in several townlands:-- John White, Clogher -- X -- 2 -- QB -- 4, Lisnegarvey -- X -- QB -- 2. Henry Bell, Clogher -- X -- 2 -- RBC -- 3, Tonagh -- X -- RBC -- 3, Old Warren -- X -- 4 -- RBC -- 5, Largymore -- 2 -- RBC -- 2. Hu Mulholland, Old Warren -- X -- RBC -- 5, Lisburn -- X -- RBC -- 4, Largymore -- 2 -- RBC -- 4. The compiler would appear after he had gone some two-thirds through the work to have ceased to use the reference X. The Borough of Lisburn, according to a map dated 1833, in possession of Mr. Geo. Sands, C.E., comprised parts of Glenmore, Knockmore, and Largymore, and all of Lisnegarvey, Tonagh, and Old Warren. 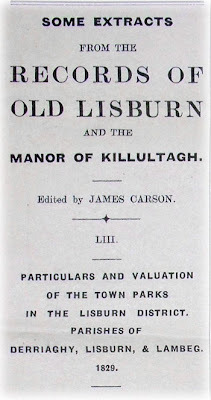 In the report from the Commissioners on Municipal Corporations in Ireland, 1833, volume iii., is a map of the borough of Lisburn, entitled "The Ancient Boundary from Local Enquiry." This map only specifies the townlands of Old Warren, Tonagh, Lisnegarvey, and Lambeg South as being within the borough boundary. It is also stated that by an Act of William IV. in respect to members to serve in Parliament a small portion of County Down was included. Volume ii. specifies the number of voters registered as 91. The constituency in 1883 was composed of £5 -- Irish currency -- inhabitant Householders under Act Geo. III., and £10 -- British currency -- householders under Reform Act William IV. The Boundary Commissioners, 1833, proposed new limits which were much more confined than the "ancient limits." Thus, the borough would appear to be comprised within a line starting about Longstone Lane, thence to new R.C burying-ground, Intermediate School, Friends' School, railway bridge, Belfast Road, J. N. Richardson's old beetling engine-house beyond the Island Mill, point where Young Street joins the Old Hillsborough Road, Piper Hill, Manor House, and back to Longstone Lane. Dr. Whiteford -- X -- RBC -- 1. John White -- X -- 2 -- QB -- 4. Wid. Joseph Beatty -- X -- 3 -- W -- 6. Robert Blackburn -- X -- 4. John Smith -- X -- OB -- 3. John M'Namara -- 4 -- QC -- 8. John Ferguson -- 2 -- RB -- 5. John Tuton -- X -- 2 -- 7. Dr. Whetherhead -- X -- RBC -- 5. Robt. M'Connell -- 4 -- L -- 9. Rt. Parkinson -- X -- 3. Henry Bell -- X -- 2 -- RBC -- 3. Jamas Corken -- X -- 8 -- QB -- 4. John M'Connell -- X -- QB -- 2. Wm. Graham -- X -- 5 -- RC -- 12. Ralph Briggs -- ML -- 1. John Briggs -- 5 -- ML -- 11. Chas. Shields -- X -- 4 -- RB -- 10. Wm. Chapman -- X -- 3 -- H -- 6. Jas. M'Donnall -- RC -- 4. Alex. Blackburn -- 2 -- RC -- 3. Jos. Blackburn -- 3 -- ML -- 4. Henry Maguire -- 5 -- ML -- 9. Jas. Stephenson -- 2 -- ML -- 3. Geo. Emmerson (Hertford Arms) -- 2 -- 15. Robt. M'Analey -- QB -- 4. Chas. Casement -- RBC -- 3. Geo. Emmerson -- 7 -- 22. John Johnson -- 2 -- 4. John Matthews -- QB -- 2. Henry Dickey -- QB -- 2. Hugh Boyd -- 3 -- RB -- 2. Tamna (or Tonagh) Townland -- Lisburn. Wm. Corken -- X -- 3 -- L -- 4. Jos. Blackburn -- X -- 2 -- 6. Wm. Moorhead -- X -- QB -- 3. Edw. Phillips -- X -- 3 -- QB -- 6. David Beatty -- X -- 2 -- RC -- 5. Wm. Nuckle -- X -- 5 -- L -- 4. Wid. Richardson -- X -- 2 -- W -- 5. Wid. Smalley -- X -- W -- 2. Robert M'Call -- X -- 2 -- RC -- 4. Adam Dickey -- X -- QB -- 4. Thos. Pattison -- X -- 3 -- QB -- 3. George Whitla -- X -- 2 -- RBC -- 4. Thos. Corless -- X -- 2 -- 2. Ever. Phillips -- X -- 2 -- RC -- 2. Jos. Scandret -- X -- 2 -- RB -- 2. Saml. Gamble -- X -- 5 -- RBC -- 18. Mrs. Singer -- X -- 3 -- W -- 5. Jno. Singleton -- X -- 2 -- QB -- 4. Dr. Wetherhead -- X -- RBC -- 3. Jas. N. Richardson -- X -- 3 -- RBC -- 7. Henry Bell -- X -- RBC -- 2. James Hanna -- X -- 5 -- QB -- 5. Jas. Ferguson -- X -- 4 -- H -- 6. John Crosley -- X -- RBC -- 4. Mrs. Higginson -- X -- W -- 2. Mrs. Jno Carleton -- X -- 4 -- W -- 11. Jas. Mussen -- X -- 5 -- RBC -- 7. Robert Garrett -- X -- RB -- 3. Cap. John Fulton -- X -- 4. John Yarr -- X -- 2. Richd. Green -- X -- RBC -- 3. Thos. J. Smith -- X -- 3 -- QB -- 2. Benjamin Neely -- X -- 2 -- QB -- 3. Charles Shields -- X -- 2 -- RB -- 5. Alex. Blackburn -- X -- RC -- 6. Rev. T. Thompson -- X -- RC -- 2. Wid. Querry -- X -- 1. Andw. Briggs -- 6 -- ML -- 6. James Christy -- 3 -- -ML -- 3. Jas. Steenson -- 5 -- ML -- 5. George Moore -- X -- 4 -- QBC -- 19. Hugh Bell -- H -- 4. Dr. Turner -- X -- 4 -- QB -- 6. Robt. Stewart -- X -- RBC -- 4. Robert Ekin -- X -- 3 -- QB -- 6. Jas. Kennedy -- X -- QB -- 5. Wm. Drake -- X -- 4 -- 4. Jas. N. Richardson -- X -- RBC -- 5. Robt. Graham -- X -- 2 -- QB -- 5. Wm. Anderson -- X -- QB -- 2. Robt. Blackburn -- X -- 2. Jas. Ferguson -- X -- H -- 4. Francis Turner -- X -- 5 -- QB -- 5. James Sterritt -- X -- QB -- 2. Richd. Dawson -- X -- QB -- 3. John Clarke -- X -- RB -- 4. Geo. Pentland -- X -- 4 -- 8. Saml. Kennedy -- X -- RC -- 5. Robt. Stewart -- X -- 2 -- RBC -- 6. Wid. Curran -- X -- 7 -- ML -- 13. James Toush -- 11 -- ML -- 9. Wm. Jefferson -- 5 -- ML -- 3. Wid. M'Cann -- 4 -- ML -- 6. John M'Cann -- 2 -- ML -- 2. Wm. M'Gann -- 4 -- ML -- 3. John M'Gann -- 7 -- ML -- 7. Geo. Smith -- 2 -- 5. Wm. M'Gowen -- ML -- 4. Jos. Tolerton -- 2 -- QBC -- 7. Wm. Hodgen -- RC -- 5. John Orr -- X -- 8 -- 10. Wm. Morrow -- X -- 5 -- ML -- 6. John Wheeler -- X -- 2 -- 5. O. Cunningham -- X -- 5 -- ML -- 13. Robt. Gordon -- X -- 3 -- ML -- 3. John Brady -- X -- 2. Wm. Lackey -- X -- 1. John Lackey -- X -- 4 -- L -- 3. Frans. Benson -- X -- 4 -- 8. Robt. M'Cown -- X -- 5 -- 7. Geo. Hodgen -- 7 -- ML -- 6. Patk. Rogers -- X -- 2 -- QB -- 3. John Crossley -- X -- 2 -- RBC -- 5. John Ferris -- X -- 8 -- L -- 3. Robt. Aiken -- X -- QB -- 5. Old Warren, Parish of Lisburn -- West of Longstone Lane. John Hill -- X -- 3 -- RB -- 7. John Herdman -- X -- 5 -- H -- 7. Jas. Stewart -- X -- RB -- 3. Jas. Magennis -- X -- QB -- 5. Wid. Singer -- X -- W -- 1. Hector Allen -- X -- H -- 6. James Neil -- X -- 1. Robert Graham -- X -- RB -- 3. Margt. Johnson -- X -- 3 -- W -- 5. Jas. Lapping -- X -- 2. Wm. Coulson -- X -- 3 -- RBC -- 9. John Brady -- X -- 2 -- QB -- 5. Dr. Musgrave -- X -- 3 -- RB -- 6. Thomas Bell -- X -- QB -- 3. Wm. Flemming -- X -- 2 -- RC -- 3. James Stirrit -- X -- 2 -- QB -- 3. Rodney Cahoon -- X -- 2 -- QB -- 5. John Dixon -- X -- 4 -- QB -- 6. Mr. Higginson -- X -- QB -- 5. Mich. Savage -- X -- 2 -- QB -- 4. Wm. Singleton -- X -- QB -- 3. Saml. Kennedy -- X -- 2 -- RC -- 6. Edwd. Gribbin -- X -- 5 -- L -- 3. John Gillen -- X -- QB -- 2. Jas. M'Donald -- X -- RC -- 1. Wid. Thompson -- X -- W -- 1. Jas. Hodgen -- X -- RC -- 1. Hu Anderson -- X -- 2 -- QB -- 3. Wid. M. Thompson -- X -- 2 -- W -- 1. Henry Bell -- X -- 4 -- RBC -- 5. Thos. Rogers -- X -- RB -- 2. Robt. Garrett -- X -- 3 -- RB -- 8. John M'Dowell -- X -- 3 -- QB -- 4. Robt. Townley -- X -- 3 -- 6. John M'Gough -- X -- 3 -- QB -- 4. Old Warren -- East of Longstone Lane. Henry Hicks -- X -- 3 -- QB -- 8. Robt. Johnson -- X -- 8 -- QB -- 12. Nathl. Johnson -- X -- 6 -- L -- 10. Wm. M'Donally -- X -- 3 -- QB -- 4. Saml. Sergeant -- 4 -- QB -- 4. Wm. Innis -- X -- 5 -- 4. Wm. Black -- X -- 1. Mr. Higginson -- X -- QB -- 7. Jas. Johnson -- X -- 4 -- QB -- 10. Rt. M'Gullagh -- X -- L -- 2. Neil Fairy -- X -- L -- 2. Wid. Brady -- X -- W -- 2. Wm. Matthews -- X -- 1. John Singleton -- X -- QB -- 2. Mathew Mussen -- X -- RBC -- 5. Hy. Higginson -- X -- 2 -- QB -- 3. John Herron -- X -- 2 -- 3. Wm. Graham -- X -- 5 -- RC -- 8. James Hodgen -- X -- 6 -- RC -- 6. John Cox -- X -- 3 -- 4. James Dean -- X -- 1. Wm.. Boomer -- X -- 3 -- QB -- 6. Hu Bell -- X -- H -- 3. Jno. Mulholland -- X -- 3 -- H -- 6. Thos. Pelan -- X -- QB -- 4. Hu Mulholland -- X -- RBC -- 5. Wm. Matthews -- X -- 2 -- 4. Jas. M'Cann -- X -- QB -- 2. John M'Cann -- X -- 2. John Fulton -- X -- 4 -- 11. Mr. Burney -- X -- 4 -- QB -- 7. Mr. Whitla -- X -- 2 -- RBC -- 2. Wm. Dillon -- X -- 2 -- QBC -- 4. John Laverty -- X -- 2 -- 2. Geo. Whitla -- X -- RBC -- 5. Richd. Carleton -- X -- 2 -- W -- 7. 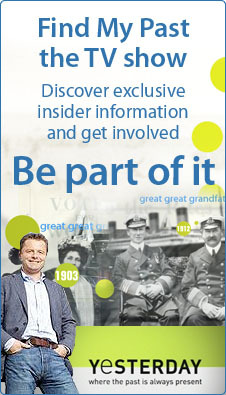 The folks at findmypast.co.uk are taking to the airwaves with a new TV series called - aptly enough - Find My Past the TV show. 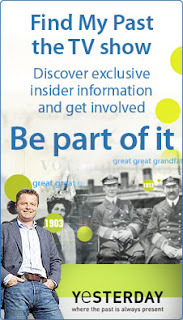 Each week, in a 10-part series, it take three members of the public on a journey to discover how they are related to someone from a significant historical event, by searching the records on findmypast.co.uk. It follows each of them as they uncover who their ancestor is and the part they played in history before uniting the participants to find out how they are connected. The show, which will be presented by the BBCs Chris Hollins, is to be screened on Thursdays from 20 October 2011 at 9pm on the Yesterday channel: (Freeview channel 12, Sky 537, Virgin Media 203). This little volume of 32 pages was published in Liverpool, and the cost of publication defrayed by the Downshire family. It is set forth that it was "Privately printed, for presentation only," and the author signs himself "A Former Resident."' The volume is the result of a large amount of careful research and observation. The first 21 pages deal with Kilwarlin, and. the author Las taken considerable trouble to define accurately the past and present boundaries of the territory. 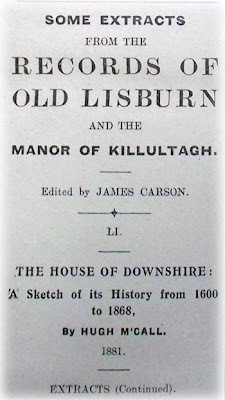 The remainder of the book contains a history of the Hill and Downshire family, with a poem entitled "Hillsborough Town," describing the festivities that took place in that town on the occasion of the marriage of the Marquis in 1837. 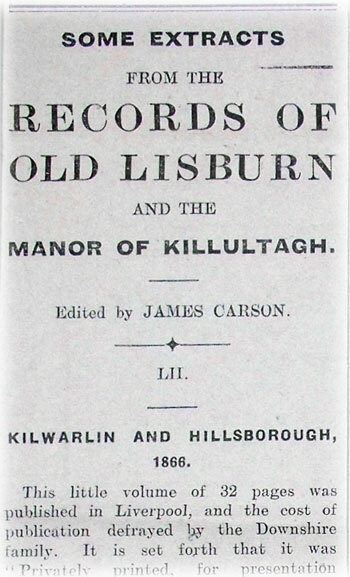 Mr. George Allen, the Estate Office, Hillsborough is the possessor of a copy of this book, which contains in addition to the printed matter valuable and copious manuscript notes from the pen of Mr. Smyth, of the same office, dealing with the genealogy of the Downshire family. J. W. Kernohan, M.A., Presbyterian Historical Society, also possesses a copy of the volume. "Some years ago the writer compiled a Pedigree History of the Earls Conway of Lisburn, showing the descent of blood, property, name, family honours, &c., with illustrations. It was intended to follow it up by tracing in like manner the family history of James Hamilton, Earl of Clanbrassil and Viscount Clanboye; but the former was not printed, and the latter was never completed." 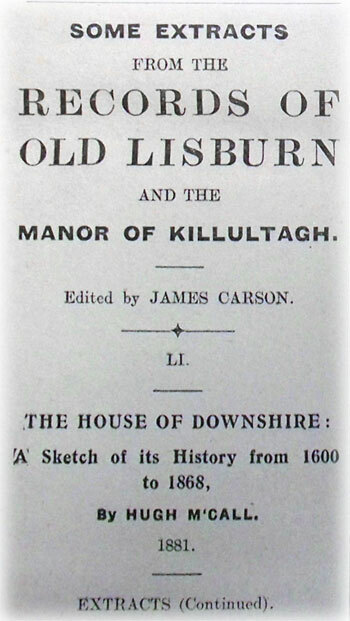 Kilwarlin was one of the great territories of the County of Down, some of which have become modern Baronies. Dymmok's Treatise on Ireland, 1600, refers to it as "Mac Roris Cuntry." 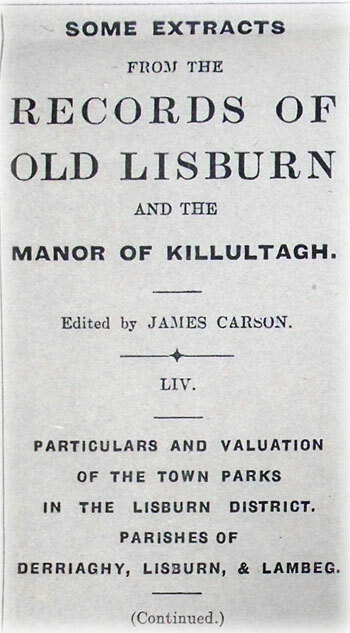 Killultagh, or Derry-Killultagh -- the oak-wood of Ulster -- was described in 1515 as "the great, forest Keylultagh." In 1586, Lord Burghley in his Description of Ulster says:-- "Kilwarlyn, boundinge uppon Kilultagh, is a very fast a woodland, the capten thereof by sirname is a McGenis, called Ever McRorie." The Irish Inquisitions, 1631, No. 29, state that it comprised forty-five townlands, but the Maze was said to contain two and a half. Killultagh in the County of Antrim includes tho Parishes of Crumlin, Glenavy, Ballinderry, Aghagallen, Aghalee, Magharemesk, Lisburn, Magheragall, Tullyrusk, and part of Derriaghy. In the early part of the Seventeenth century, old Bryan McRowry Megennes lived at Edenticullo, probably in a part of that which is now the Large Park. The Large Park appears to have been formed out of portions of three townlands Edenticullo, Crumlin, and Clogher. The Small Park is taken wholly out of Crumlin or Hillsborough. The Large Park contains 985 acres and the Small Park 68. Griffith's Valuation, 1839. Bryan McRowry Magennis alienated in 1611 to Colonel Moyses Hill seven townlands. His son and grandsons in the following 25 years alienated the remainder of the property. Irish Inquisitions, Nos. 31, 54, 59, 60. In the Down Survey by Sir William Petty, 1655, the name Kilwarlin is restricted to a parish. The Chapelry of Crumlin had formerly been a portion of the large parish of Drumbo, but in Petty's time it was the parish of Kilwarlin or Crumlin, now Hillsborough. Larcom's History of the Down Survey. Drumbo -- The hill of the cow. Crumlin or Camlin -- The crooked glen. Ballykeel -- The place of the wood. The Maze -- The place of the plain. Bally-keel-agh-ardtifinny -- The place of the wood at the white hill. Carnbane -- The white stone heap. Carnreagh -- The royal stone heap. Carnalbanaugh -- The stone heap of the Highlanders. Spencer's Bridge is so called from, the house of Captain Henry Spencer, which stood on the Antrim side, and is mentioned by Petty. He was a contemporary officer in Queen Elizabeth's army with Sir Fulke Conway and the governor of the Fort of Innisloughlin. Barrack Hill was a street of Hillsborough in which there were barracks; the Warren Gate originally led to a rabbit warren, and at the Union locks the Lagan blends with the canal. The Hollow Bridge is over a defile so deep that there is a descent even; to the crown of the arch, and such names as McKee's Bridge, Halliday's Bridge, &c., are derived from neighbouring residents. Rock's Hill, the hill with projecting rocks, is often improperly pronounced Rogue's Hill; and there is a Gallow s Burn at the entrance to Dromore, where executions formerly took place. Speed's map of Kilwarlin is dated 1610. The term "Hillsborough" referred originally to the town, not to the parish. Harris in his History, so late as 1744, calls it Crumlin Rectory, "the Chappel of St. Malachy at Hillsborough." The term Hillsborough seems to have been first applied to the Manor 1651, then to the Fort 1661, yet still there was no town, or even village. When Sir Wm. Brereton -- Brereton's Travels, by Hawkins -- passed it by in 1635 he found nothing to notice. The visit of King William III. to Hillsborough is referred to. Authorities -- Diary of Dean Davies, by Caulfield; Three Months' Royal Campaign in Ireland, 1690, by Samuel Mullenaux, M.D. ; A True and Impartial History, 1691, by Rev. George Storey. The ancient family mansion appears to have stood just to the south of the limits of the Small Park. Harris records that it was destroyed by fire, and that barracks were erected on its site. The remains of these were visible up to 1825, and the street which led past them on the way to Moira was called Barrack Street or Barrack Hill. It contained the residence of Mr. Hugh McCay, attorney, and of Miss Stott, who was murdered along with her maidservant in 1825. In it also was the Quaker Meeting House, which on the Ordnance map 1837, is represented as standing alone. About 1826 the street was obliterated, the Moira road being made to diverge southward from its contact with the park wall. The triangle included by Barrack Hill and its continuation, the new piece of road, and the line to Dromore, was added to the private grounds. Near the bridge at the bottom of Barrack Hill stood the old church of Crumlin, and its graveyard, or "God's Acre," formed part of the present Small Park and of the pleasure grounds attached to the house. The ruins were visible in 1744, but the church had been removed to its present site in 1662 by Colonel Arthur Hill. The present beautiful structure, however, was not erected till 1773. It is a becoming memorial of the munificence of the first Marquis. There was a large willow tree, sometimes called the Kate Rush Tree, which marked the site of the old graveyard. It was blown down in the great storm of 6th January, 1839, when portions of human bones were exposed amongst its roots. There is a tradition that the tree was named after a "simple" girl named Kate, who wandered about the country. She amused herself by constantly plaiting rushes, till her proper surname was almost forgotten. She also walked on foot to Crumlin with all the funerals of the neighbourhood. On the day when she was carried to her own last resting-place, about 1792, a young man stuck at the head of her grave a willow twig, which grew into a great tree, hence the name the "Kate Rush" Tree. It would appear from Harris that the lower part of the town was first built, and the upper portion not much more than a century ago. Between them was a hill so precipitous before it was cut that the wonder is why it was made the street of a town, or why people thought of erecting houses at its sides. Harris further refers to the intention of Lord Hillsborough to build a new mansion house and a new town -- the town to be built in the form of a large square, with a stately market-house in the centre. A very expensive brewery, with malt-houses, consisting of two large squares, was erected by the late Lord contiguous to the town, which hitherto had not been converted to that use. Prior to 1800 there were frequent contentions between the Broomhedge men and Hillsborough or Kilwarlin men over the right to get turf from the Maze Moss. They usually fought with quarterpole and singlestick. In 1775 some bayonets stolen from Hillsborough Fort were used. David Gray, of Broomhedge, was stabbed. Tom Bulger, of Hillsborough, was executed for the murder. This beautiful ballad is from the pen of Alfred Perceval Graves. It appears in his "Irish Poems" -- Countryside Songs and Ballads -- 1908, and is set to music in "Songs of Old Ireland." Padric Gregory considered it worthy of a place in his "Modern Anglo-Irish Verse," 1913. Mr. Graves was the son of the Protestant Bishop of Limerick. He has produced numerous poems, songs, and ballads. "Father O'Flynn" was written by him. He was an Inspector of Schools, from which position he retired in 1910. "I'm going," he sighed, "from Ballinderry. And there, in the gloom of the groaning mast,"
THE RETURN OF PHELIMY HYLAND. This sequel to "'Twas Pretty to be in Ballinderry" was written by James N. Richardson, author of "O'Neill of Munster," 1880; "The Baron's Dream," 1887; "Reminiscences of Friends in Ulster," 1915; "The Quakri at Lurgan," 1887; "The Quakri at Lurgan and Grange," 1899. Mr. Richardson is a member of the Society of Friends, is closely related to several well-known Lisburn families, was born in 1846, represented the County of Armagh in the Imperial Parliament, 1881-1885, and resides at Bessbrook, Newry. Tho' I always loved him, my handsome boy. "Out and across the stormy sea. Open your arms and come to me. We kissed our first and we kissed our last. Phelimy Hyland, come back to me. Till perchance we meet on the farther shore. Open your arms and come to me." True and faithful and back to me. He bared his head and I bowed my knee. And again I visit the, ivy tree. And Phelimy Junior on my knee. was bora in Hillsborough on the 6th of August, 1812, and spent his boyish days at the Castle. From mere childhood he exhibited points of character widely different from those of his father, and this not less in physical appearance than in sturdy determination of purpose. As a lad he seemed full of life and spirit, and many tales were told about his feats of strength, few youngsters, even of much maturer years than those to which he had attained, having been able to match the young lord in athletic sports. And yet he was the very reverse of being quarrelsome; on the contrary, he displayed all the kindliness of feeling and natural good temper which marked his whole career in after life. On the 6th of August, 1833, was celebrated the twenty-first birthday of the sturdy nobleman afterwards known as the fourth Marquis of Downshire. The gathering of the clans that took place in October, 1809, when that Peer's father attained his majority, was very large, but the assemblage fell far short of the immense multitude that turned out on the later occasion. According to the ancient custom, there was the immense bullock and quite a flock of sheep in course of being cooked before enormous fires. These, with what seemed to be a mile in length of dinner-tables spread over the park grounds, formed one of the sights that, in the early part of the day, attracted its crowd of spectators. Bradshaw and Moreland provided for the occasion ample supplies of "the wine of the country," and that of a quality which Doctor Paxton, who was no ordinary judge of aqua vitæ;, said, "Would have stirred up the blood of an anchorite." Barrels of ale, the number of which might have puzzled Cocker himself to enumerate, were set up in every quarter; and out of all sorts of vessels, glass, delf, and wood, the foaming beverage was drunk in copious quantities. The dinner passed off in the very spirit of the feasts at which the feudal princes of old entertained their followers while celebrating some signal victory. It is to be regretted that the baronial feasts, which tended to draw closer together the bonds of kindliness between the landlord and his people, are rarely heard of in these days. In the year following the entertainment Lord Hillsborough was High-Sheriff of Down. On the 30th of October, 1834, he presided at the great Protestant meeting held in a large field near Hillsborough -- probably one of the greatest gatherings ever seen in the county. Dr. Cooke, the Demosthenes of the General Assembly, was there. Lord Hillsborough sat as one of the representatives of Down for several sessions in the Imperial Parliament, and was a strong supporter of Sir Robert Peel. In August, 1837, he married Lady Carolina Stapleton, eldest daughter of Viscount Combermere -- a gallant soldier who, as the reward of his brilliant services in leading England's troops to victory during the wars against Napoleon, was raised in 1814 to the British peerage. The young Countess was exceedingly handsome, quite equal in personal appearance to all that has been heard of the long line of beautiful women that for more, than two centuries had graced the halls of Hillsborough Castle. We have seen that from the days of Sir Moyses Hill each successive heir of the ancient house added to the extent of this family prosperity, the result of which accumulation was that the fourth Marquis succeeded to a principality the income of which exceeded that of any dozen of those petty princes of Germany, many of whose descendants, as a popular writer has stated, "cling like limpets to the rock of Britain's Exchequer." According to a Government return relative to the extent of properties held by the landowners of the United Kingdom, the Downshire estates consist of 74,680 acres in Down, 15,779 acres in Wicklow, 13,928 acres in King's County, 9,544 acres in Antrim, 2,077 acres in Kilkenny, and 1,355 acres in Kildare. The English estates of the same house include 5,287 acres in Berkshire, and 281 acres in Suffolk, making a total territorial area of 122,995 acres, all of which, according to the same official account, is valued at £99,742 per annum. Such was the extent of lands in England and Ireland, and the income thereof, to which the new heir became entitled on his accession in April, 1845. The Celtish Isle of the West was then in a state of unwanted prosperity; its population, which in 1805 was 5,396,456, had increased during the fifty years to 8,520,000 -- a ratio of progress exceeding that noted respecting any other nation in Europe. Agricultural enterprise had been carried on during the intermediate period with the utmost activity; the linen and cotton manufactures of Ulster were in the healthiest condition, general commerce was equally prosperous, and altogether it seemed as if brighter days had at length dawned on the home of the Hibernian. Mr. George Stephenson succeeded Major Matthews as agent for the estate, and after him came Mr. W. E. Reilly. This gentleman held office for more than one-quarter of a century, and in times when no law save the unwritten codes of justice interposed between the arrangements of landlord and tenant in Ulster, Mr. Reilly was, perhaps, the most popular agent that ever ruled in the rent office of any other Irish estate. Faithfully did he discharge his duties to the noble Marquis, but in doing so he never forgot to keep in view the industrial immunities of the tenants, and in every case he protected their rights with the same sense of official equity as he guarded the interests of the landlord. After the much-lamented death of this worthy agent, Major Rowan was appointed to the situation; but very different was his mode of dealing with the tenants as compared with that of Mr. Reilly's administration, and he was not popular. The first public appearance of the young Marquis of Downshire after his accession to the family title and estates was that on which he took the chair at an indignation meeting held on the 20th of August, 1845, in a field situate on one of the hills that rose above the Lisburn station of the Great Northern Railway. Mr. James Watson, the popular proprietor of Brookhill, had been deprived of his Commission of the Peace, as well as his deputy-lieutenancy of the county, because of having attended a meeting of the Orange leaders held in Lisburn early in the July of that year. Sir Robert Peel's Government was then nearly as much under the control of the Young Irelanders as Lord Melbourne's Cabinet had been by the Tribune of the people -- Daniel O'Connell -- and his followers, some years before, and to repudiate every form of Orangeism throughout Ulster was a leading point of its policy. "The Old Commodore,: as Mr. Watson was called, had been a steady friend of law and order for half a century. As captain of the local corps of yeomanry he had led one section of the loyal troops at the battle of Antrim in June, '98. where his horse was shot under him and he himself narrowly escaped a similar fate. Residing as he did at Brookhill, and keeping up the fame of a country gentleman, a worthy magistrate, and an enthusiastic lover of turf and field sports, he enjoyed universal popularity with peer and peasant, and the action of the Irish Government in depriving him of his magisterial honours caused widespread indignation. And in that feeling the Conservative party was heartily joined by many Liberals, all of whom held the chief of Brookhill in the highest respect. 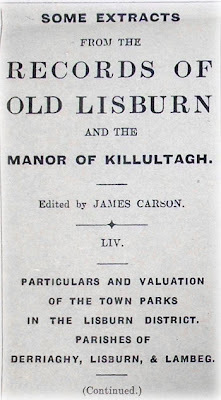 When arrangements had, been made by Mr. Watson's friends for the purpose of getting up a meeting of sympathisers in Lisburn great difficulty was experienced in obtaining a field in which to hold it; some gentleman who had formerly professed much friendly feeling towards the Orange system were actually afraid to lend the use of their townparks for that purpose. Mr. David Beatty was applied to, and at once gave the committee full permission to erect a platform, for the speakers and hold the meeting in his large grazing field, a spot since famed as Watson's Hill. It was estimated that fifty thousand people, including nearly all creeds and classes, attended that great convention; seventeen magistrates stood together on the occasion and joined in the general denunciation of the course taken by Lord Haytesbury and the other authorities of Dublin Castle. Many magistrates in the South of Ireland had before that time taken active part in the meetings held under the leadership of Daniel O'Connell, M.P., the object of which was to demand a repeal of the Legislative Union, and if those Justices of the Peace had not been superseded it was considered most unjustifiable to make a political martyr of Mr. Watson. The demonstration was one of the most enthusiastic ever seen in the North of Ireland; hundreds of the people who attended on that day had travelled on foot from different parts of this and the next county, and those that were present and are still denizens of this lower world will not forget how much the stalwart presence of the noble Marquis, as he presided over the vast concourse of people, added to the imposing appearance of the meeting. The practical importance of landlord residence had never been so fully brought out as it was during the never to be forgotten time of 1847 and '48, when dearth, disease, and death swept like so many "destroying angels over every province in Ireland. Then it could be seen what were the vital advantages of residence. Samuel Richardson, brother of the Jonathan Joseph Richardson, an ex-M.P. for Lisburn, was then busily engaged in the Island Flax-spinning Mill, but he found time to visit three times a day the fever patients that lay in great numbers under tents erected on the mound opposite the Manor Hospital. While engaged in contributing to the spiritual as well as the temporal wants of those poor people he caught the fever, and only survived the attack a few days. All that time the absentee proprietors of some hundreds of thousands of acres in the Northern province were living far away from the cry of distress that rang through town and village, and seemingly little concerned about the terrible visitation that had fallen on the people. The first attack of the potato disease in Ireland came over the fields in the autumn of 1846. It was, however, only a partial failure. The estimated area of land under that crop for the same season rather exceeded 1,300,000 acres, and the loss ran up to about three millions of money. Next year the extent of Ireland's potato lands was fully equal to that of 1845, and until the end of July the appearance of the growing crop was all that could be desired. But, as if by some influence beyond human ken, the fields were suddenly struck by blight, the tops or vines became blackened, and the greater portion of the bulbs rotted in the ground. No pen could portray the dread results of that national visitation. The tens of thousands of small farmers in the South and West of Ireland who depended for their winter's food on the produce of their potato lands were left all but destitute, and incredible numbers died of direct starvation. The Parliament of that day did all that Imperial power could accomplish for arresting the combined influences of famine and fever; but so intense were these afflictions that they revelled, as it were, in destructive power, and seemed to defy man's attempts to arrest the calamity. In common with his brother residents, the Marquis of Downshire was at his post throughout the winter of 1846-47. He visited the farmhouses and cottages within several miles of Hillsborough Castle, sparing neither his purse nor his person in energetic exertions for the relief of the people. I have stated that, besides his seventy-five thousand acres of land in Down, the Marquis owned large estates in Antrim, Wicklow, and the King's County, and in each of these he gave gifts, of food, clothing, and money, and that benevolence was exercised as well outside as within the boundaries of his own estates. In course of a public meeting called to arrange about extending the means of relief he uttered the memorable words:-- "I will stand by the people and attend to their wonts, even should I be obliged to mortgage part of my estates for that purpose." It has been estimated, and this on correct data, that the Marquis of Downshire expended between fifteen and twenty thousand pounds in alleviating the distress that prevailed in the famine years. During those dread seasons a noble marquis whose large estates bordered those of Downshire lands resided as usual at his Entresol in Paris, far away from the scenes of sadness and sorrow that existed on his Irish property, and when appealed to by his agent for a contribution towards the local relief fund he only subscribed seven hundred and fifty pounds. The annual rental of that absentee peer was about sixty thousand; he ruled over the estate for eight-and-twenty years, and during all that time he paid but one visit to his Antrim property. On the entire face of the country in almost every district the brand of poverty was seen on both man and beast. Horses and horned cattle seemed to have had their share of privation, from the effects of which many of them did not revive for many months. Workhouses were so much crowded that temporary places had to be fitted up for the residence of the poor. In July, 1847, there was a relief roll, the aggregate number on which reached the highest point ever known in the annals of any other nation's pauperism, namely, 3,020,700, or nearly 45 per cent. of the total population of this island. A great decrease had taken place during the succeeding twelve months, at the end of which the figures were 2,043,000 persons; but in July, 1849, the number of Ireland's poor who received rations was 2,142,766, a considerable increase compared with that of the previous return. These figures are taken from Sir George Nichol's work on the Poor-Law as it was carried out by local taxation and Imperial funds during the years of extreme destitution. The number of people actually supported in the union workhouses in Ireland on the 1st of July, 1844, was 620,747; in 1850 the decrease was above one-half, say 307,970; and during the succeeding ten years self-support had become so general that on New Year's Day, 1860, the total census of Ireland's pauperism had fallen to 44,929 persons. The first great demonstration that took place in Ulster on the tenant-right question was held in the Old Theatre of Belfast during the memoral year 1848, and the utmost enthusiasm prevailed. Every seat in the pit was crowded with the farmers of this and the next county; the boxes had their full complement of occupants, many of these being of the fairer part of creation; and the stage formed the platform on which appeared, the gentlemen who were to address the meeting. Captain Crawford, J.P., of Red Hill, was voted to the chair, and after a few words expressive of the honour conferred on him in electing him to the position of president of the large and highly respectable meeting, he added that as a landowner he had the utmost pleasure in taking his seat. He thought the time had come when the money which the Irish tenant had in the soil should be made as sure to him as if he had invested it in shares in the Ulster Railway or in the stock of one of their local banks. After some further remarks the chairman called on the Rev. Dr. Montgomery to address the meeting. The pastor of Dunmurry was received with loud cheers; indeed, it required some special tact on the part of the chairman to get the wild enthusiasm of the farmers cooled down. At length silence prevailed, and never in all the course of his busy life did the doctor advocate any cause with such brilliant eloquence as he did that of the right of the Ulster landholder to a full enjoyment of the fruits of his own industry. "With me," said the doctor, "this is no ordinary subject. I am the son of a farmer. My earliest recollections are circled around every bush and bramble that reared its head on those broad acres tilled by my respected parent." The original advocate of the farmers' rights spoke for more than an hour, and amid plaudits equal to any ever run out from the "gods" in the old Thespian palace. From that day the agitation for tenant-right continued to take a leading place in public affairs, but as a r$le landlords and agents gave it little countenance. There seemed to be a lot of dread that a portion of the old feudal power would pass out of their hands if the tenants become more independent. The early summer of 1850 brought considerable strength to the tenant-right cause, and meetings of farmers on different estates became pretty general. A deputation was appointed from North-East Ulster to go over to London and lay the state of affairs before Government, and, among others, Mr. John Ferguson, of Ballinderry, was selected to represent the Hertford estate. On arriving at the British capital they sought and had interviews with Lord John Russell and his colleagues, and also with Sir Robert Peel. In all these instances they were received with the utmost courtesy, and in course of discussion they stated that on the Downshire, the Hertford, the Londonderry, the Brownlow, and other estates in Ulster the principle of tenant-right was fairly recognised; but they were desirous of having what had been only a mere custom fully certified by law. A promise was given that the whole matter would be laid before Parliament, and with that assurance the deputation returned home in good spirits. The tenants of the Hertford estate resolved to have a pubic meeting in Lisburn, and for that purpose sought the use of the Assembly Room. Their request was kindly granted by Dean Stannus, agent of the property, and in June, 1850, a very influential turnout of tenant farmers, merchants, and others, took place -- Dr. Dill, of Blaris Lodge, in the chair. The speakers on that occasion were Mr. John Ferguson, Mr. Millar, Dr. Hume, Mr. M'Call, and Mr. Joshua Lamb. In course of the same month another influential meeting of tenant-right men was held in the Music Hall, Belfast. Among the many interesting and really historic evidences of the respect in which the fourth Marquis of Downshire was held by the farmers on his estate, one of the most remarkable was that of the dinner given to him by the Kilwarlin tenants on the 13th of November, 1851. That great event came off in the Assembly Rooms of the Corporation Arms, Hillsborough. The room had been very tastefully decorated for the occasion. Laurels, holly, and roses were placed round the walls in graceful festoons, and the mottoes "Geade Mille Failthe to our Landlord," "The House of Hill," and "Live and Let Live." About three hundred covers were laid, and among those present were several Belfast and Lisburn merchants, and others who had joined with the tenantry in paying a mark of respect to the noble Marquis. The turnout was exceedingly numerous; every seat had its occupant, and the dinner passed off with the greatest good humour. After the removal of the cloth Mr. Hercules Bradshaw. J.P., Culcavey Cottage, was called to the chair. On his right was the guest of the evening, and on either side the Rev. Dr. Cooke, of Belfast, and the Rev. Henry Montgomery, D.D., of Dunmurry, took up their places. The usual loyal and patriotic toasts having been given and duly honoured, the chairman called on all present to fill their glasses to the brim. He would wait until every person present was prepared to give full play to the toast. When full arrangements had been made under that practical chemistry in which the people of Hillsborough have long been adepts, the chairman proposed, in his own stentorian tones, "The health of the Marquis of Downshire, one of the best of Ireland's landlords." The marriage of Lord Downshire's daughter, Lady Alice Hill, to Viscount Kenlist took place in the autumn of 1867, and the event was signalised by the tenantry of nearly every townland on his lordship's different territories presenting to their landlord congratulatory addresses. Some exceedingly handsome wedding gifts were also presented by them to the young bride, and for the time being the Castle at Hillsborough rejoiced in more than its wonted scenes of festivity. While all this series of affairs was going on, a young merchant of Lisburn suggested to a friend that it would be a graceful compliment to the noble Marquis, for whom the people of the town entertained so much respect, if an address were got up there congratulating his lordship on the auspicious event. No time was lost in making arrangements for acting on the hint thus thrown out. A committee was formed, and a document was prepared and signed by men of every creed and class in Lisburn and its neighbourhood. When all had been settled Mr. David Beatty, secretary, wrote Lord Downshire apprising him of the proposed presentation. To that letter his lordship replied, and having expressed his great pleasure at the attention about to be paid him, appointed Thursday, the 31st October, at half-past one o'clock, for receiving the deputation. Accordingly, at that hour the following gentlemen, who had driven up to Hillsborough, were received by his lordship at the Castle:-- Mr. John Dr. Barbour, J.P.; Mr. Jonathan Richardson, J.P.; Mr. John Hamill, J.P.; Mr. R. Jefferson (chairman of the Lisburn Town Commissioners), Dr. Musgrave, the Rev. Mr. Pounden, Mr. David Beatty, Mr. Hugh M'Call, and Mr. W. Graham. The members of the deputation were severally introduced to the noble Marquis by Mr. Richardson, and were afterwards ushered into the library, were Lord Hill-Trevor joined the party. After spending a very enjoyable hour or so, the deputation rose to leave; the Marquis accompanied his guests to the entrance hall, and, with a few graceful words respecting the honour his Lisburn friends had conferred on him, he shook hands with each member as they left the Castle. It is sad to think that in less than ten months after that season of festivity at the Castle of Hillsborough the nobleman so well and so favourably known as "The Big Marquis of Downshire" was numbered with the dead. He had gone over to England in July, 1868, on his usual visit to his estates there, and early in the following month went down with the family to Herne Bay, where apartments had been prepared for his lordship and suite at the principal hotel. On the morning of the 6th of August he was passing through the great hall when he became suddenly ill, and before medical aid arrived the spirit of the great man had passed away into the unseen land.